show MORE results . . . .: THE RENAISSANCE COURT. Monastic libraries, in obedience to the demands of the public voice, yielded up their treasures of ancient literature, whilst the soil of Italy was made to disgorge its mutilated fragments of antique art. The effects of these sudden, unexpected, and precious acquisitions may readily be imagined; they created a complete revolution in literature and art throughout Italy, which spread thence into other countries. The two beautiful arts of painting and Sculpture saw with emulative shame their present inferiority in the ranks of Art; and in their noble aspirations towards the perfection newly placed before them, they assumed their position as distinct and legitimate creations. 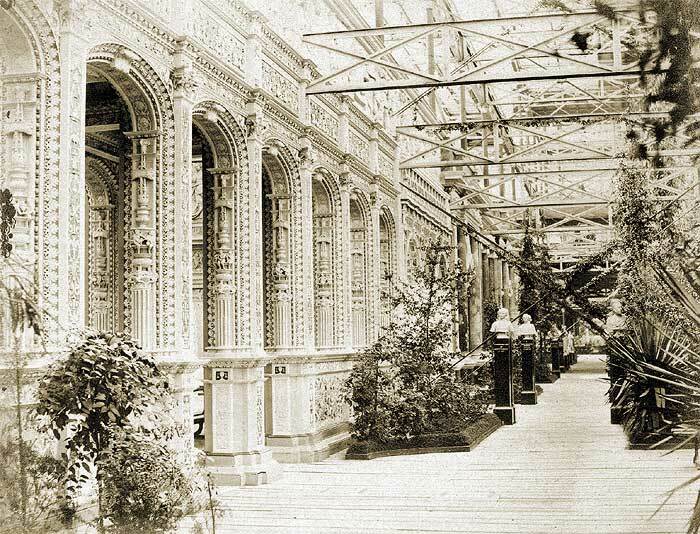 But if the Gothic systems was now dying out, it had left at least one valuable legacy to the future, in its appreciation and adoption of natural models. The Italian artists of the 15th century received the gist joyfully, and, combining it with what treasures antiquity afforded them, produced a style which, in sculpture, especially, as all the freshness of nature and the refinement of the antique, as both were capable of being united by gifted men whose names have come down in glory to our own day, and will command the admiration of the latest posterity. 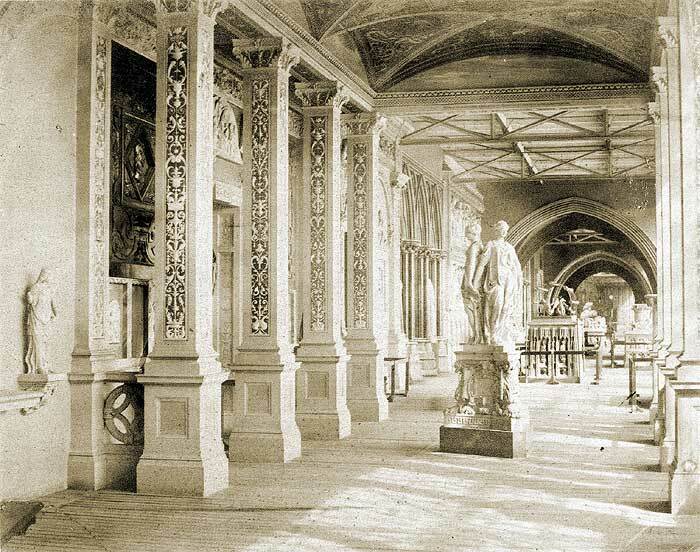 On no branch of art did the revival of the antique more strongly act, than on the art of architecture; the Gothic style, which had never taken deep root in the soil of classic Italy, speedily fell altogether in that country before the recent discovery and imitation of the Roman antiquities. No powerful body of Freemasons was there, as in England, France, and Germany, to oppose the progress of the new style; and the individual energy of such men as Brunelleshi, Bramante, and the great architects of the northern states, soon established it on an indestructible basis. And, however much a partisan spirit may decry this or that particular style, the productions influenced by the revival of the antique, throughout the 15th century, especially in architecture and sculpture, will never fail to excite our astonishment and emulation. Entering the Court, we find in the lunettes under the ceiling of the small loggia, or gallery, portraits of twelve of the most celebrated persons of Italy, Spain, France, and Germany, of the Rennaissance period, including in the central compartment Francis I., of France, and Catherine de’ Medici. In the compartment to the right are, Lorenzo de’ Medeci and Lucrezia Borgia; and, in that to the left, Mary of Burgundy and Maximillian of Germany. In the centre of the Court we find a fountain of the Renaissance period, from the Chateau de Gaillon, in France; and on either side of the fountain are two bronze wells, from the Ducal Palace at Venice. Directing our steps to the right, we may first examine the decoration on the lower part of the interior of the façade, the bas-reliefs of which is taken from the high altar at Granada Cathedral, in Spain. 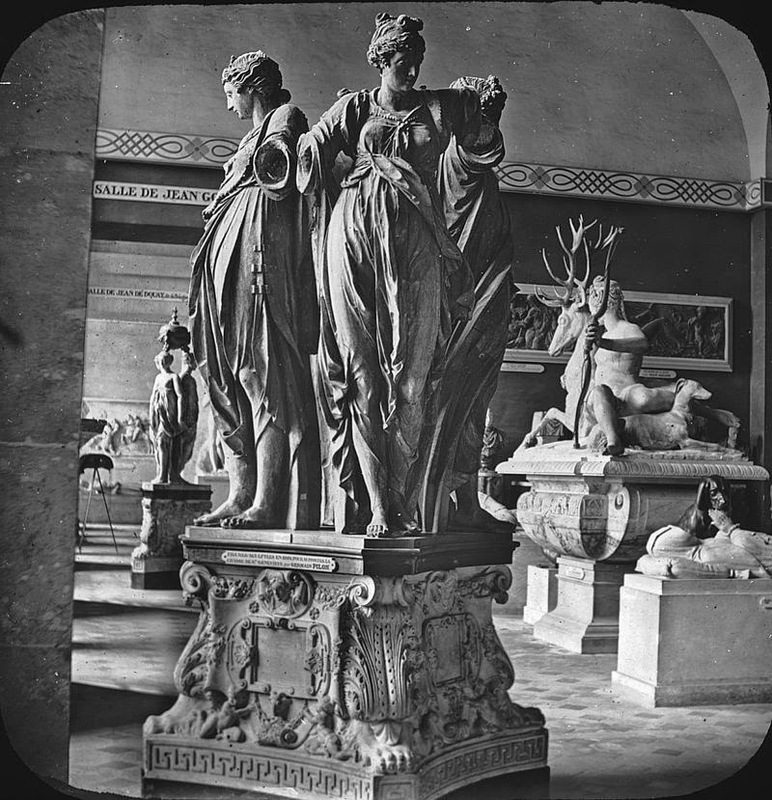 The statue in the centre is that of the wife of Louis de Poncher, the original of which is now in the Louvre; its date may be assigned to the early portion of the 16th century. The altar on which the statue is placed is from Certosa near Pavia, in Northern Italy. 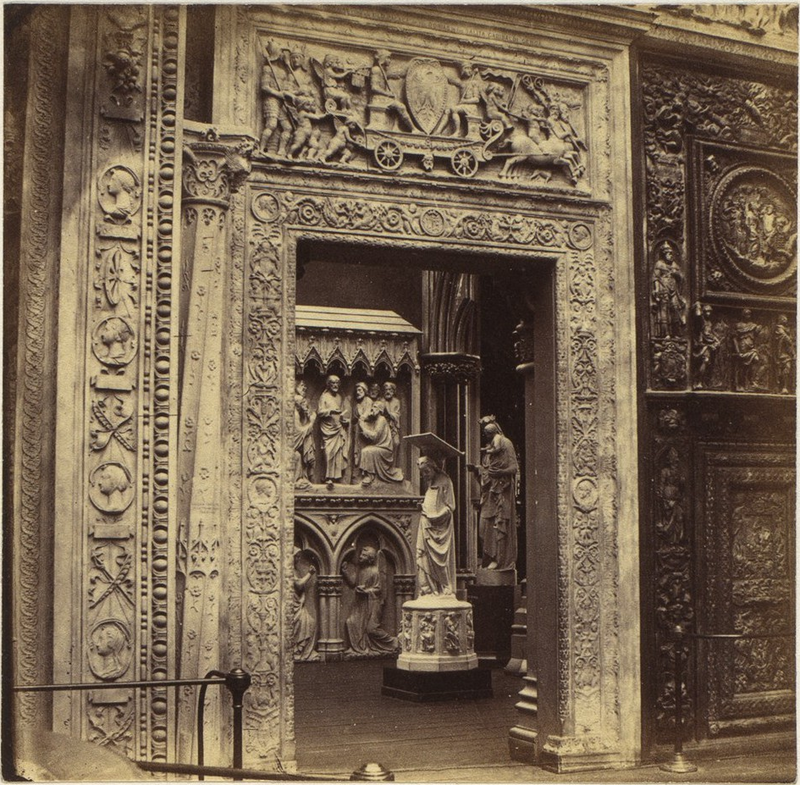 The first object on the side wall is a door, by Jean Goujon (a French sculptor who executed many works at the Louvre), from the church of Saint Maclou, at Rouen; then a doorway from the Doria Palace at Genoa, a fine specimen of the cinque-cento; above this are five bas-reliefs from the museum at Florence, representing Faith, Prayer, Wisdom, Justice, and Charity; and beyond it, one of the most beautiful objects in the palace, a copy of the far-famed gates from the baptistery at Florence, executed by Lorenzo Ghilberti, who was occupied upon his work for the space of twenty-one years. One glance is sufficient to assure the spectator that sculpture had indeed advanced to an extraordinary degree of excellence at the period which we have now reached. The visitor having sufficiently admired these “Gates of Paradise,” as Michelangelo termed them, will proceed on his way, passing another doorway, which, like that on the other side, already seen, is from Genoa. Close to it, is a door by Goujon, corresponding to the door in the opposite corner. On the back wall we first notice a composition made up from various examples of cinque-cento work. 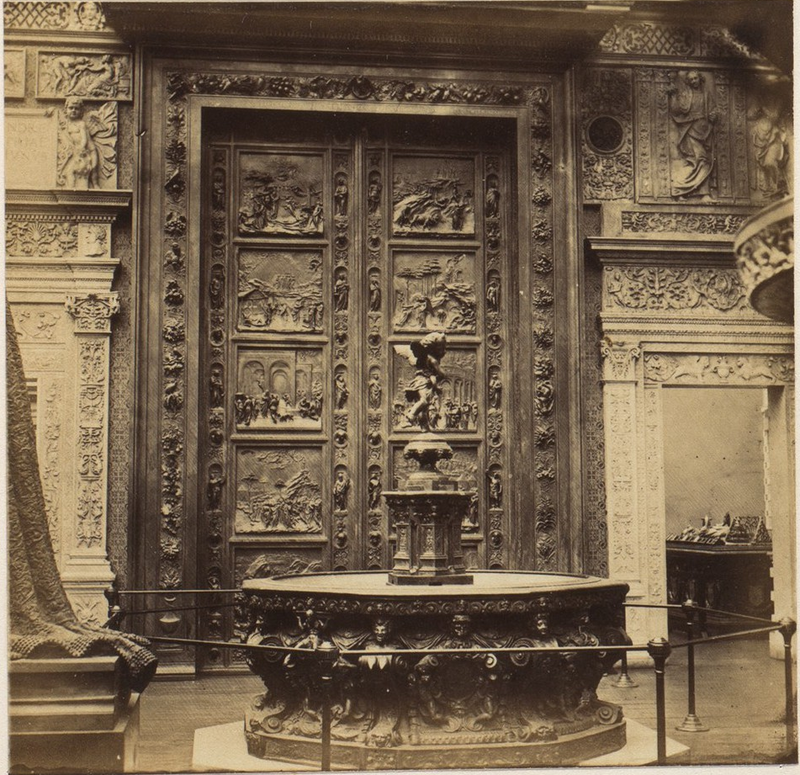 Adjoining it is a portion of an altar from Certosa, near Pavia, -- a beautiful specimen of sculptural art of the time. Next to this is another piece of cinque-cento composition, from specimens at the same Certosa, from [Milan ?] Cathedral and other places. 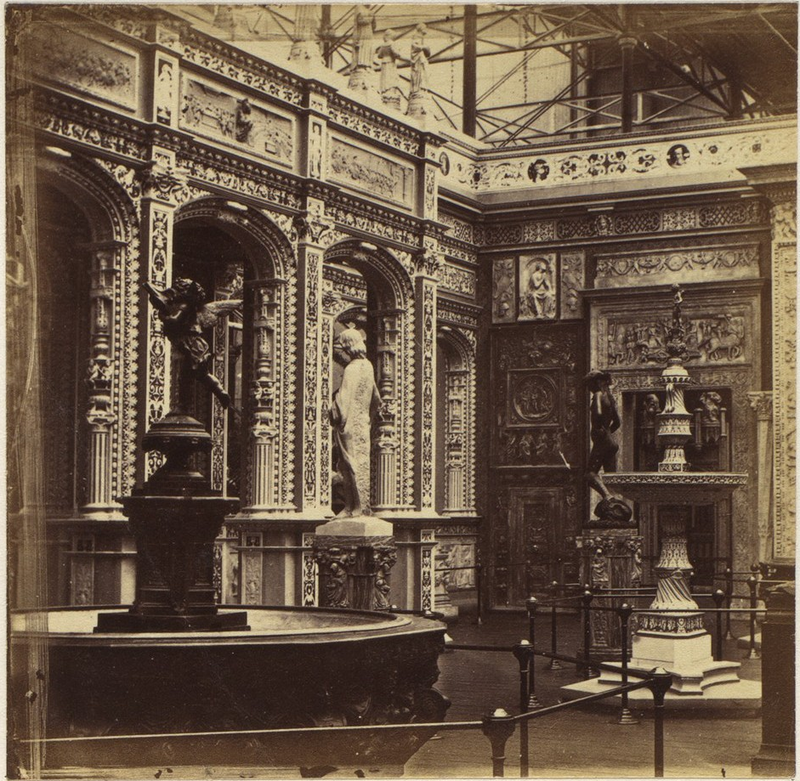 In the centre, two Colossal figures (Caryatides), from the Louvre, by Jean Goujon, support a large cast of the Nymph of Fontainebleau, by the celebrated Benvenuto Cellini. 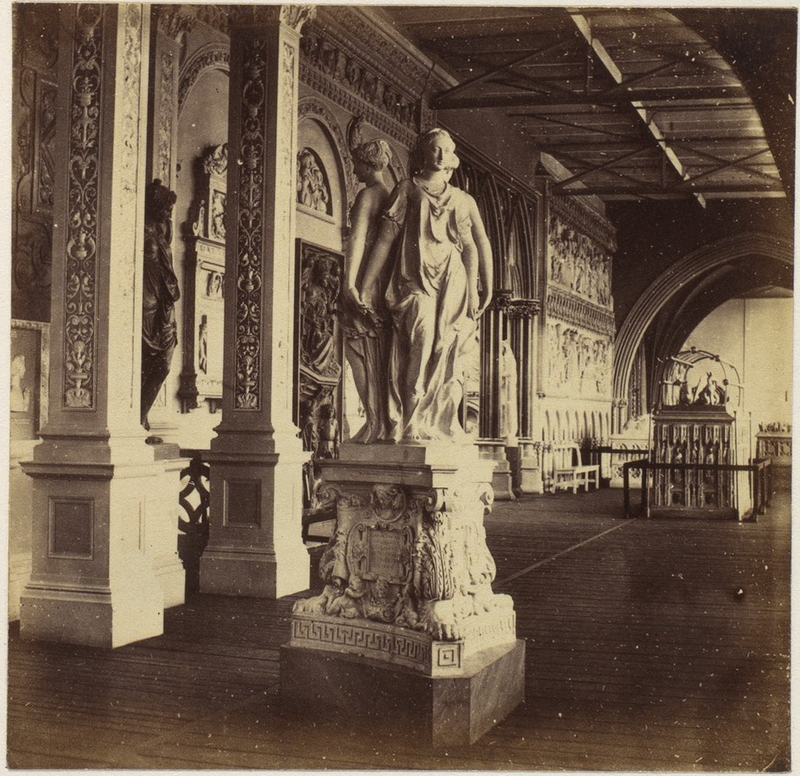 Next to the Caryatides we see an exquisite specimen of a portion of the interior of the principal entrance to the Certosa most elaborately carved, and the panels filled in with bas-reliefs; the doorway by its side is from the Hotel de Ville, of Oudenarde, in Belgium. It stands out from the wall and looks very like an antique cabinet or screen. Another architectural example from the Certosa follows, being a sort of military monument erected to the memory of G. G. Visconti, Duke of Milan, the date of its execution is the end of the 15th century. On the side next the French Mediaeval Court is first another oak door from Saint Maclou by Jean Goujon and then a doorway, from Genoa; and, above it, the frieze of “The Singers,” by Luca della Robbia, the original of which is at Florence, a most charming work, full of life and animation. next to it, another doorway, from the Doria Palace at Genoa; and in the corner a fourth door from Saint Maclou, by Goujon, the central bas-relief of which represents the baptism of Christ. The lower part of the interior of the façade is devoted to examples of Italian sculpture of the 15th century, including a head of St. John by Donatello. The monument placed against the wall is that of Ilaria di Caretto, from Lucca Cathedral, executed by Jacopo della Quercia, of Sienna, early in the 15th century: it is a very fine example of the cinque-cento style. Two statues by Donnatello cannot fail to be noticed -- his St. John and David, which display great power and study of nature. 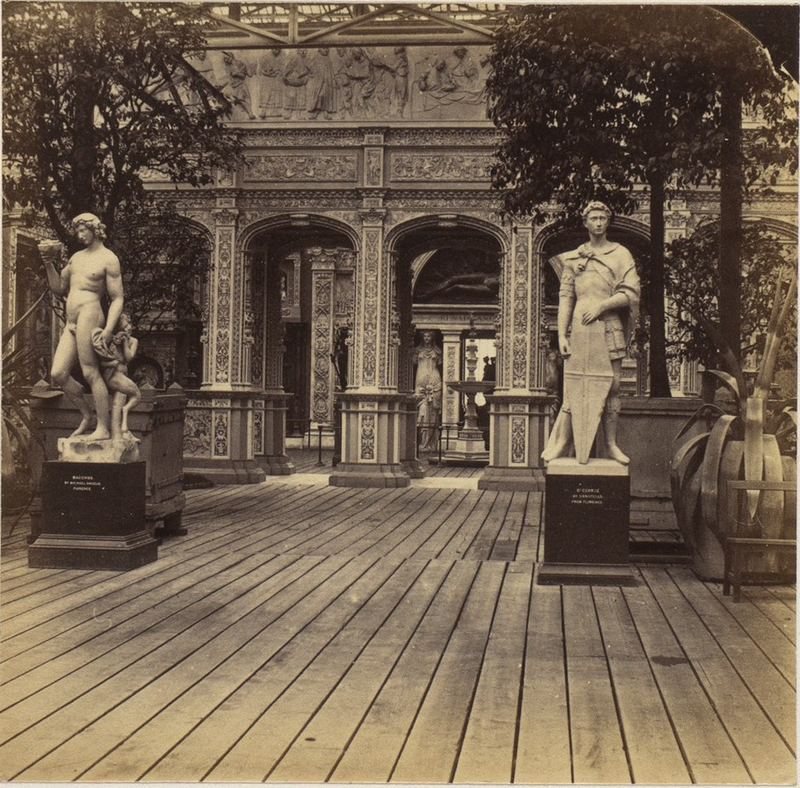 We now pass out through the doorway under the Nymph of Fontainbleau, and enter a vestibule in the Renaissance style. Here on the ceiling, is a copy of a painting from the Sala del Cambio (Exchange) at Perugia, in Italy by Perugino, the master of Raffaelle, who assisted Perugino in the work. The painting represents the Seven Planets, with Apollo in the centre, as the personification of the Sun. The wall of the Renaissance Court to the left of the entrance is decorated with terra-cotta arches, and a frieze from the Certosa; the singing boys in the frieze are of great merit. The bronze monument in the centre is that of Lewis of Bavaria, a very interesting example of late German Gothic, remarkable for the finish of its details. On either side of the doorway are parts of Goujon’s doors from St. Maclou, at Rouen. In the centre of the gallery are placed Germain Pilon’s “Graces,” now in the Louvre, a charming example of the French school of sculpture. 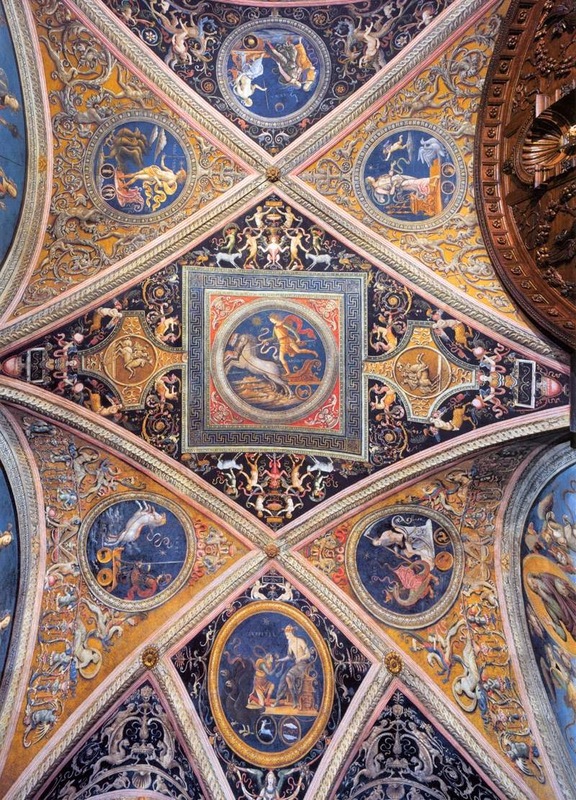 The four angles under the Perugia ceiling are occupied by four statues, also by Pilon; and the very remarkable bronze effigy [Mariano Sozzini] in the centre, against the garden, is from the Museum at Florence; it is ascribed to Vecchietta of Siena. The kneeling effigies in the gallery are from the Hertford monument in Salisbury Cathedral, probably erected in the first half of the 17th century. On the back wall, to the right of the doorway, are richly ornamented arches in terra-cotta, from the large cloisters of the Certosa, and also bas-reliefs and specimens of the Renaiissance style from various parts of Italy. The central monument of Bernard von Gablenz is an exceedingly fine example of the style as practised in Germany, at the close of the 16th century. After examining these objects, we turn into the narrow court adjoining the Renaissance Court, and find ourselves in The Elizabethan Court. Passing through the central door, beneath the bronze Nymph, into the garden gallery, we find the beautiful ceiling by Perugino, from the Sala di Cambio, at Perugia. Apollo in his chariot occupies the central lunette. The very successful reporduction has been executed by Mr. Frederick Smallfield from elaborate studies made on the spot by the architect under whose superintendence this work has been carried out. The decorations of the adjoining beams &c., have been taken from the ceiling of the library at Sienna, and in the panels are inscribed the names of those arabesque painters, whose genius developed under the fostering care of Perugino, most contributed to elevate the character of Italian Renaissance mural decoration.. The wall to the left [north] on entering the gallery, is ornamented with the arches and entablature from the small cloister of the Certosa, near Pavia. They are finely executed in terra cotta. The heads of the circular panels are characterised by great picturesqueness and force, and the singing boys are highly praised by the judicious Ciognara in his "Storia della Scultura." Unfortunately the name of the artist of these beautiful cloisters is not ascertained. the pilasters, from the monuments of Gian Galeazzo Visconti, are sculptured with a clever and bold arrangement of armours and weapons, in which antique forms predominate. The first pilaster to the right [north ?] on the wall opposite to the gardens, is from the top of the Giant's Staircase, at the Ducal palace, Venice. The side of the palace from which it is taken was commenced by Antonio Bregno in 1486, and finished by Scarpagnino in 1550; the present example belongs apparently to the work of the first-named master. The centre panel of the monument next to it (which is from the Church of San Teodoro at Genoa [Demolished 1870 to build the new "General Warehouse" ]) represents a recumbant figure of the Infant Christ, with an angel at his head, behind whom is a kneeling ecclesiastic. In front kneels Mary in adoration, and behind her is a monk; in the sky are glorifying angels. Four female saints . . .
Next to this is the very magnificent Transition monument of the Emperor Lewis of Bavaria. At the top the Emperor Lewis of Bavaria. At the top the emperor is seen enthroned beneath a draped canopy, drawn aside by two angels; beneath his feet are shields charged with the double-headed eagle . . . . . . . . . . the ornamented tile pavement on which they stand is represented in persepective, and some of the squares are ornamented with shields charged with monograms. The armour . . .. Above this is a beautiful semicircular composition of the Virgin and Child, with adoring angels one each side - a graceful specimen of Italian Renaissance sculpture, preserved in the Royal Museum, Berlin. The next monument is from the Church of San Teodoro, Genoa. Gracefully designed winged genii rest mournfully on each side of the central panel, which, from the smoothness of its surface, appears never to have had an inscription. The pilasters are ornamented with the chalice, book, cross, and other articles of church service, seeming to indicate that a priest was honoured with this memorial. The lowest sculptured panel represents the Resurrection. The Marys approach the sepulchre, on which sits the angel who announces that event. The upper panel shows Christ Rising from the Tomb, some of the guards being asleep and others terrified. The style is Lombard Renaissance, of the close of the sixteenth century. Between the pilasters of the doorway are portions of Jean Goujon's doors at Rouen (1542). The ornament shows a tendency to that abruptly carved scroll-work which prevailed so generally in the sixteenth and seventeenth centuries. The Alpha and Omega in the small circles are ingenuously combined with the monogram of Christ, surmounted by . . . .
On each side of it are two excellently designed figures from the cloisters of the Certosa, Pavia; the brackets on which they stand are from the tomb of Cardinal d'Amboise at Rouen (1525). The frieze above is from Genoa. On the other side, beneath Goujon's door, are very beautiful compositions of the Holy Family, from the Berlin Museum; that to the left is attributed to Perino da Vinci, nephew of the great Lionardo, a notice of whose life we hve already given. The treatment . . . .
An admirable work in which, with the exception of the statues, the influenece of the antique is predominant. The figures are particularly fine. Sebastian von der Gablenz is seen in the centre, arrayed in full miltary costume of the last half of the sixteenth century. On one side of him his wife Barbara, and on the other Bernward von Gablenz. The faces are evidently portraits, and the costumes are exceedingly interesting as examples of the period. At the back are five kneeling figures; the young men in complete armour . .. . The arches above . . . . In the centre, beneath Perugino's ceiling, are the three Graces - Aglaia, Thalia, and Euphrosyne, by Germain Pilon. 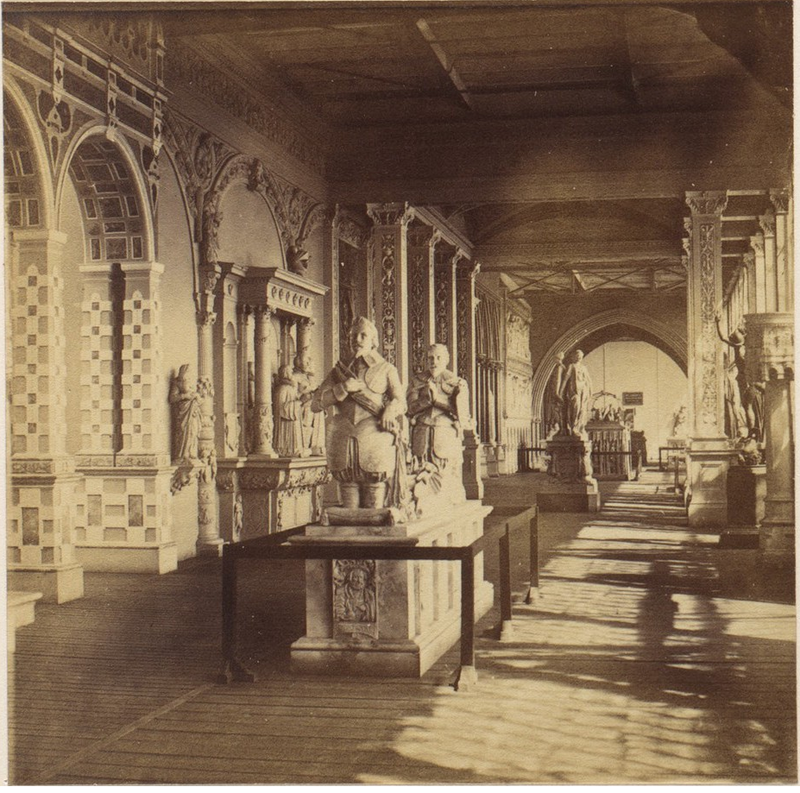 The four wooden statues at the angles are also by Germain Pilon, and are preserved in the Louvre. They are more pictorial and less graceful than those of Henry's monument; showing also more of that peculiar character which was adopted by the French sculptors of the seventeenth century. It is not ascertained from whence they came, but we find that the tome of Diana of Poitiers, at the Chateau d'Anet, had four female figures at the angles, sculptured in wood by Germain Pilon in 1570; with one arm they sustained the cornice of the sargophagus, with the other raised above their heads they held torches; and those here seen comepletely answer to the drawings of Diana's supporters, as shown in Lenoir's work. The chasse or treasure-box of the chapel of St. Genevieve, at Paris, is supported by four female figures which are their counterpart in miniature. Diane of Poitiers died in 1566. Opposite the entrance from the Renaissance Court into the gallery, beyond the Graces by Pilon, is placed the very remarkable bronze effigy of Marino da Soccino [Mariano Sozzini] by Vecchietta of Sienna, a pupil of the celebrated Jacapo della Quercia; the original is preserved in the Museum at Florence. The face, hands, and feet of this effigy are deserving of the artist's closest study and attention for their very minute treatment; and though the subject is painful, it is impossible to refrain from admiration at this, which is undounted,y one of the finest bronzes in existence. The effigies lower down [south] the gallery are from the monument of the Countess of Hertford [Catherine Grey], in Salisbury Cathedral. 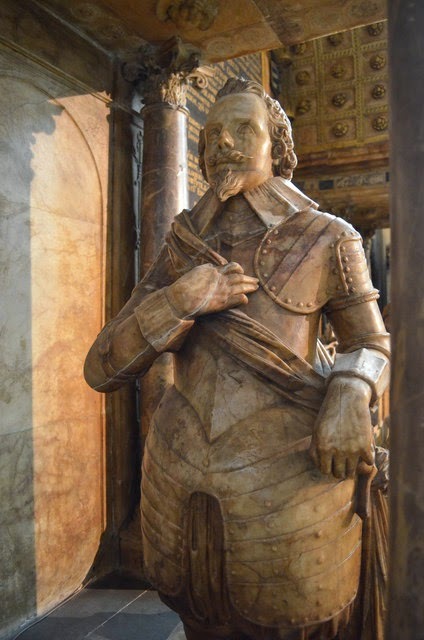 The countess died in 1563, but her husband, Edward, Earl of Hertford, not till the year 1621, at which period, Nicholas Stone was the fashionable sculptor. The monument was probably not raised till after the earl's death, but we have no way of ascertaining by whom. 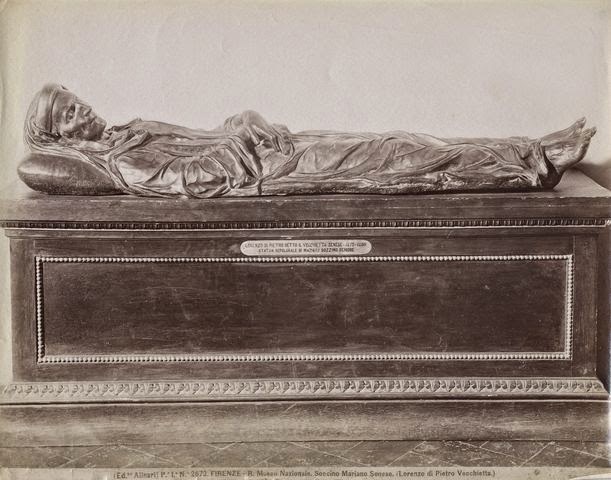 The countess reclines in full costume, very similar to that of Elizabeth and Mary Queen of Scots as seen on their monuments. The armour and costume of her two sons are interesting as a memorial of the times, and appear to be studiously correct, they indicate the close of the sixteenth, or early part of the seventeenth century. The boots of the men . . . The family were . . . 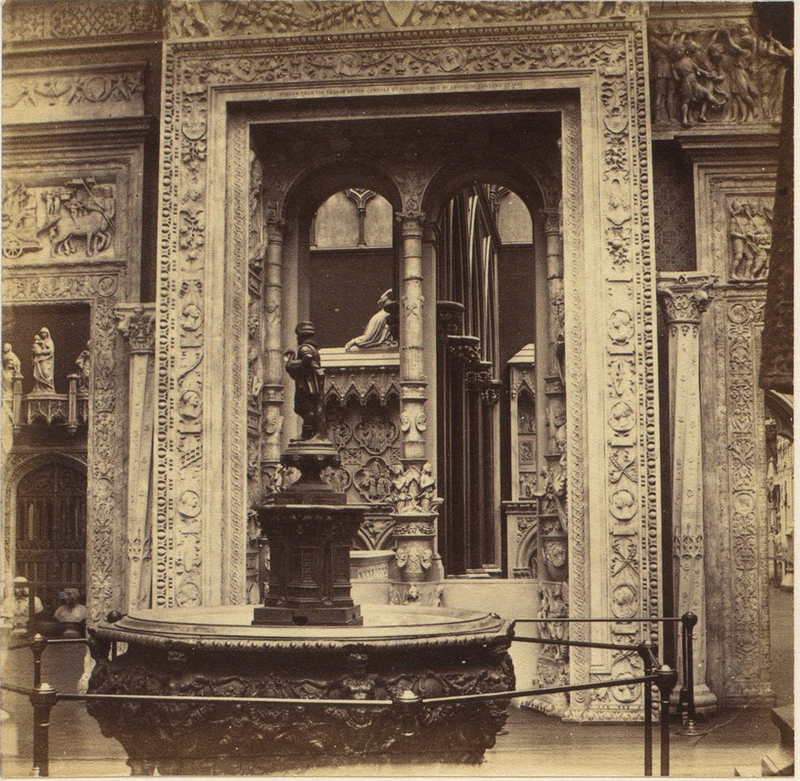 The subject near them (to the right, on the garden side) is from the very remarkable Renaissance church of St. Michael at Dijon, built about the middle of the sixteenth century; it forms a pedestal for the Virgin over the cheif entrance. The base is completely Gothic . . . .
To the left is a column from the Hotel Tremouille, Paris, which building we have already had occasion to notice. As in the case of the columns (near the Certosa window in the court) the Gothic and the Renaissance are here seen equally poised.